"For all the worship-leading questions you've shelved because there was, literally, no one to ask...shelve no more. 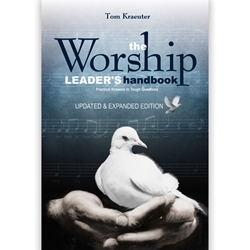 The Worship Leader's Handbook is Worship Leading 101 plus a whole lot more, condensing years of respected worship-leading experience into one thoughtful, easy-access digest. Don't lead another service without it!" Tom Krauter, worship leader, worship-seminar speaker, and author, tackles difficult issues involved in worship leading in an insightful, practical question-and-answer format. Worship Leading 101 plus a whole lot more. Condenses years of respected worship-leading experience into one thoughtful, easy-access digest. Question and answer format. Tom Kraeuter has been teaching for over ten years on a full-time basis at seminars, conferences, and retreats across the nation. With seven books to his credit, Tom has written for such magazines as Ministries Today, Worship Today, and Worship Leader. He has been part of the leadership team of Christian Outreach Church, near St. Louis, Missouri, since 1984.